Cocoa butter (CB), which is extracted from the cocoa bean, is an edible vegetable fat. CB is normally used in home and personal care products (such as lotions and ointments) and CB is an important constituent of chocolate. CB forms the continuous phase within chocolate confections and gives chocolate gloss, texture, snap, melting behavior, and resistance to fat bloom. These physical characteristics are a direct consequence of the overall crystalline structure and the triacylglycerol (TAG) composition of CB. Typically, TAG molecules assume a tuning fork configuration and the TAG “forks” assemble to form crystal lattice structures. During crystallization, the TAG molecules decelerate as the CB oil cools and the TAGs come to rest in contact with one another and form the so-called “sub crystalline cells.”1 After the formation of sub-cells, they are thermodynamically driven to aggregate into more stable, bigger crystalline structures.2 A balance of intra- and inter-molecular interactions dictate the self-assembly of sub-cell structures and their further aggregation. Depending on the orientation and molecular level packing of the TAGs, CB can form various crystal lattice structures (or polymorphs) types, where some crystal structures are more preferable than others. In general, CB crystallization is an extremely complex, multistage process. In order to enhance chocolate manufacturing processes and maintain product quality, one should understand the isothermal crystallization behavior of CB. In this article, rheology combined with in situ Raman spectroscopy was used to study the isothermal crystallization of cocoa butter. Raman spectroscopy is a non-destructive, extremely sensitive, and comparatively fast technique that can probe the conformation and molecular structure in liquid and solid TAG assemblies, as well as intra- and inter-TAG interactions. With concurrent rheological data and Raman spectra, conformational shifts and molecular-level interactions during the isothermal crystallization of CB were directly associated with the changes in bulk viscoelastic properties, offering unique insight into the multifaceted crystallization behavior of cocoa butter. Commercially available, organic cocoa butter (Theobroma cacao) was obtained from Inesscents™ (Ashland, OR, USA). 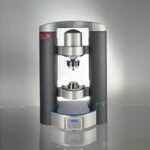 A Thermo Scientific™ HAAKE™ MARS 60 Rheometer equipped with a serrated 35 mm diameter plate rotor at a gap height of 1 mm was used to perform rheological measurements. The serrated plate was used to avoid slip at the sample-rotor interface. All measurements were performed in the oscillatory mode, with a constant strain of 0.1% and a frequency of 1 Hz. CB samples were loaded onto the rheometer at 60 °C and allowed to equilibrate for 10 minutes to remove any shear history and/or crystal structures from sample loading. Following the equilibrium step, the temperature was quickly reduced from 60 °C to 22 °C at a rate of 10 °C/minute. Following which, the temperature was held constant at 22 °C for 120 minutes, obtaining data every 10 seconds. Image 1. (a) The Thermo Scientific™ HAAKE™ MARSXR RheoRaman System. (b) Schematic diagram of the MARSXR RheoRaman system (showing side and top views of the rheometer sample stage). The iXR Raman spectrometer is free-space coupled to the MARS rheometer using lens tubes and mirrors that direct light into a 20x objective. The objective focuses the incoming laser (green dashed line) and collects the back-scattered Raman light (yellow) coming out of the sample sitting atop the rheometer stage. Raman spectroscopy measurements were conducted using a Thermo Scientific™ iXR™ Raman Spectrometer. A 532 nm laser with 10 mW laser power was used at the sample. 50-3500 cm-1 was the spectral range. The spectra were acquired using a 2-second exposure time and four sample exposures. The Thermo Scientific™ OMNIC™ Software for Dispersive Raman controlled data acquisition and processing. For the data given in the article, Sequential Raman spectra (in parallel with the Rheological measurements) were acquired over a predetermined time window using the time series collection function of the SERIES software within the OMNIC for Dispersive Raman software package. The Thermo Scientific™ HAAKE™ MARSXR RheoRaman System consists of the HAAKE MARS 60 rheometer and the HAAKE MARS 60 rheometer combined together using the HAAKE RheoRaman module (Figure 1a). The iXR Raman spectrometer was free-space combined with the rheometer by an optical train which used a sequence of mirrors to guide the incident laser into the RheoRaman module (Figure 1b). Within the module, the laser beam was directed by a mirror into a 20x objective, where the laser light was focused into the sample (perpendicularly to the vorticity plane or flow). Backscattered Raman light was acquired using the same 20x objective and directed back to the spectrometer using the same optical train as the incident laser (ultimately to the spectrograph within the spectrometer; Figure 1b). The sample was placed between the serrated 35 mm plate rotor (the textured plates were used to prevent slip at the sample plate interfaces) and a sandblasted glass bottom plate. An electrical heating element inside the RheoRaman module offered temperature control from underneath the sample, while an active electrical hood was used to give temperature control from above (removing the potential for a temperature gradient within the sample). A temperature-controlled water bath circulator supplied the cooling of the sample. Figure 2 shows the Raman spectra for the liquid phase CB melt and the crystalline solid CB in the 500-3100 cm-1 range. (approximately1460 and 1440 cm-1, respectively). Figure 3 shows the C-H stretching regions for the melted and solidified CB specimens. Two significant peaks were observedat approximately 2850 cm-1 and 2882 cm-1, which are attributed to symmetric and asymmetric CH2 stretching, respectively.2 The asymmetric vibrations at 2882 cm-1 were dominant in the solid phase, whereas the symmetric vibrational modes at 2850 cm-1 were dominant in the liquid (melt) phase. Hence, the 2850 cm-1 and 2882 cm-1 bands are strong indicators of the presence of amorphous and crystalline content, respectively.3 Subsequently, the I2882/I2850 peak intensity ratio was used to dynamically track crystal formation during the in situ RheoRaman measurements. Despite being less intense than the C-H stretching region, about eight unique spectral features were identified in the fingerprint region (1000-1800 cm-1; Figure 4). When comparing the CB melt state to the crystalline phase, the most significant changes were observed in the C–C stretching region (1000-1200 cm-1). Two prominent features emerged at 1063 cm-1 and 1130 cm-1 during the solidification process, which originate from the asymmetric and symmetric C-C stretching, respectively.4,5 In the melt phase, all C-C stretching bands were comparatively weak and broad because of the disordering effects of methyl gauche conformations. However, as the CB solidified, there is an emergence of the peak at 1130 cm-1, indicating that the backbone methyl groups were ordered into the trans-conformation. Hence, apart from the I2882/I2850 peak intensity ratio, the I1130/I2850 spectral marker was used to track the crystalline-phase transition within CB through in situ rheoRaman measurements. The melt-to-solid phase transition of cocoa butter was investigated rheologically using small amplitude oscillatory shear measurements (Figure 5a), where the storage modulus G’ and loss modulus G” were measured as a function of time at the isothermal temperature of 22 °C. G’ is the measure of material’s elastic behavior and G” is the measure of a material’s viscous behavior. A liquid-like material will be more viscous than elastic (i.e., viscously dominated), and consequently, G” will be greater than G’. On the other hand, a solid-like material will exhibit more elastic behavior than viscous behavior (i.e., elastically dominated), where G’ will be greater than G”. The overall magnitudes of G’ and G”, together with their relative difference in magnitude, often described as the ratio of G”/G’, establishes the general viscoelasticity and overall resistance to deformation for a given material. where δ is the phase angle defined as the lag or shift between the input strain and resultant stress sine waves (or vice versa) during an oscillatory shear measurement. The term “tan(δ)” is usually referred to as the loss or damping factor. Values of tan(δ) greater than unity indicate viscously dominant (liquid-like) behavior, whereas values less than unity indicate elastically dominant (solid-like) behavior. Unlike the individual moduli, tan(δ) can be used to measure the overall brittleness of a material and is generally used to assess glass transition behavior. Normally, as tan(δ) becomes smaller, G’ deviates more from G”, and the material becomes more brittle(or glass-like). During the initial part of the isothermal hold at 22 °C from 0 to 5 minutes (immediately following the rapid decrease in temperature from 60 °C to 22 °C), there was an increase in both G’ and G” as the CB transformed from a melted liquid to a soft semi-solid (Figure 5a). This initial increase in modulus is most probably due to a delay between the internal temperature and the set temperature of the loaded sample. After the sample had attained thermal equilibrium and was at the isothermal set point of 22 °C, the moduli were quite stable from 10 to 25 minutes. However, from 25 to 50 minutes, both G’ and G” start to increase gradually and then from 50 to 80 minutes, there was a rapid increase in the moduli, where G’ and G” increased by nearly 5 and 4 orders of magnitude, respectively. The exponential increase in the moduli signifies a solidification process, where the CB changed from a pliable semi-solid to a more robust, hardened solid. At 80 minutes and above, there was a gradual decrease in the growth in the elastic modulus and was eventually plateaued, showing no further considerable change after 100 minutes. However, in the viscous modulus, a slight plateau was reached from 80 to 100 minutes and then continued to gradually decrease from 100 minutes and beyond. factor denotes a deviation in overall magnitude between G’ and G”. As the CB hardened, the increase in G’ surpassed the increase in G”, triggering the decrease in tan(δ). At the end of the 120 minutes isothermal study, G’ was more than a full order of magnitude greater than G” and the loss factor was nearing 0.01, suggesting that the CB had transitioned into a brittle glass-like solid. Image 5. (a) Rheology: G’ and G” (filled and open circles, respectively; plotted on the left y-axis) and tan(δ) (plotted on the right y-axis) and (b) Raman: the I1130/I2850 (left y-axis, green) and I2882/I2850 (right y-axis, black) peak intensity ratios for CB during isothermal crystallization at 22 °C. The vertical dashed line at 45 min indicates the increase of G’ and G”, while the dashed line at 65 min indicates the decrease in tan(δ) and increase in the Raman ratios. Simultaneous Raman spectroscopy was used to further confirm the observed rheological behavior (Figure 5b). At first, both the I1130/I2850 and I2882/I2850 peak intensity ratios remained unaltered during the first ~65 minutes of the isothermal study. Then at ~65 minutes, the ratios I1130/I2850 and I2882/I2850 started to increase sharply, signifying the formation of crystal structures within the CB. With further crystallization of CB, there was a continuous increase in both spectral markers from 65 to 100 minutes. Beyond 100 minutes, the growth in both Raman features had slowed down and the peak intensity ratios began to stabilize. On the whole, both the rate of increase in the 1130 and 2882 cm-1 spectral ratios and the rate of change for G’ and G” (i.e., they increased with similar slopes) were similar. However, there was a visible 15-20 minutes lag between the observed increase in G’ and G” and the increase of the Raman intensity ratios. The sharp upturn in G’ and G” denotes an increased resistance to deformation (i.e., a bulk hardening of the CB), signaling the start of the solidification process. On the other hand, the Raman spectral markers are indicators of crystal formation. Therefore, the time delay between the Raman profiles and rheology implies that CB first hardens into an amorphous solid, and subsequently the amorphous solid transforms to a crystalline solid. This morphological transformation was indicated by the subsequent increase in the Raman band intensities associated with crystal CB structures (the 1130 and 2882 cm-1 peaks). A clear distinction between bulk hardening of the CB and the formation of crystalline domains was signified by the temporal separation of the rheological and Raman spectral profiles. One interesting fact was that there was a direct correlation between the increase in the Raman spectral features (I1130/I2850 and I2882/I2850) and the observed reduction in tan(δ) (Figure 5a and b). The loss factor is an indication of material brittleness, and crystalline structures are usually known to be brittle. Thus, it is logical that the formation of crystal domains at the molecular level (as indicated by Raman) coincides with the overall brittleness of the CB. Therefore, the loss factor may be a more revealing indicator of bulk CB crystallization than G’ and G” alone. Raman spectroscopy and rheology measurements were simultaneously used to study the isothermal crystallization of cocoa butter. This multimodal analytical technique enabled the bulk mechanical properties of cocoa butter (G’, G”, and tan(δ)) to be directly associated with conformational changes at the molecular level (νas(CH2) mode at 2882 cm-1 and the νs(C-C) mode at 1130 cm-1) in real-time. There was a clear time lag between the rheological response (G’ and G”) and the Raman spectral profiles, after rapid cooling (10 °C /minute) and at an isothermal temperature of 22 °C. The observed time delay denotes that CB crystallized by initially hardening into an amorphous solid, manifested by a rapid increase in G’ and G” while the Raman features remained the same. Subsequently, the amorphous solid underwent a morphological transition to form a crystalline solid, amorphous solid, denoted by the increase in Raman features associated with crystal CB structures (1130 and 2882 cm-1). It was possible to observe the amorphous-solid to crystalline-solid transformation only by combining these two separate analytical techniques. By themselves, both techniques require a singlestage process, but the multi-phase crystallization process is revealed only by coupling the two techniques. This further demonstrates the unique analytical capability obtained by coupling rheology with in situ Raman spectroscopy. Although this experiment focuses on the isothermal crystallization of CB, the fundamental principles applied here should be relevant for an extensive range of material processes such as curing behavior, polymerization, gelation, as well as other shear-induced phenomena. 1. K. Sato, Crystallization of Lipids: Fundamentals and Applications in Food, Cosmetics, and Pharmaceuticals. Hoboken, NJ: John Wiley & Sons, 2018. 2. S. Bresson, D. Rousseau, S. Ghosh, M. El Marssi, and V. Faivre, Raman spectroscopy of the polymorphic forms and liquid state of cocoa butter, Eur. J. Lipid Sci. Technol. 113, 992–1004, 2011. 3. R. G. Snyder, H. L. Strauss, and C. A. Elliger, C–H stretching modes and the structure of n-alkyl chains. 1. Long, disordered chains, J. Phys. Chem. 86, 5145–5150, 1982. 4. R. J. Meier, Studying the length of trans conformational sequences in polyethylene using Raman spectroscopy: A computational study, Polymer. 43, 517–522, 2002. 5. M. Zheng and M. Du, Phase behavior, conformations, thermodynamic properties, and molecular motion of multicomponent paraffin waxes: A Raman spectroscopy study. Vib. Spectrosc. 40, 219–224, 2006.